THE DISPLACED Q: With enough time and resources, what would you most like to learn in your adopted culture? A long time ago, in a country far, far away, my nine-year-old self visited a museum in England. The American Museum in Bath was my first experience of anything American that wasn’t viewed on a black-and-white TV, and, while I recall finding the museum interesting, there was one particular exhibition that is still lodged in my long-term memory: the extensive collection of antique quilts. Exquisite, detailed, and painstakingly hand-sewn by American women hundreds of years ago, these quilts and the stories behind them fascinated me. Fast forward a couple of decades, and there I was, newly arrived in New England. I’d worked out the day-to-day details of where to shop, where to bank, and how to order a pizza in a fake American(ish) accent so that it got delivered to the right address. Perhaps it was the amount of free time suddenly on my hands, or the impending arrival of another baby that put me in a domesticated mood, but when I received in the mail a brochure for adult education courses at the local high school, I signed up for Quilting For Beginners. I was in the heart of quilting territory, and I was going to make one of those big quilts. How difficult could it be, if women two hundred years ago made them by hand, by candlelight? The course lasted for eight weeks. 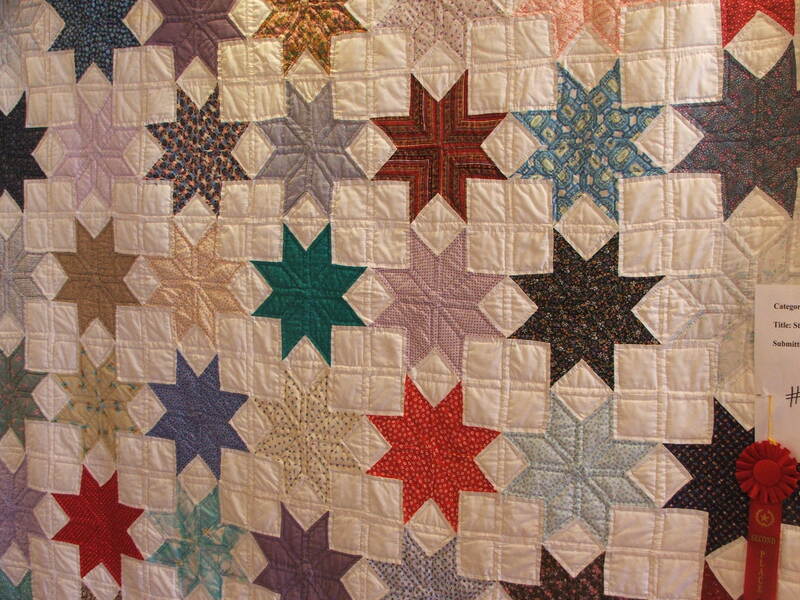 If I’d previously admired the Old American quilters whose handiwork graced the museum in Bath, at the end of those eight weeks they had achieved god-like status in my mind. It’s not as if I was a novice at sewing. My mother, an expert needlewoman and daughter of a tailoress herself, had taught me the basics long ago. But whereas I was making a small lap-quilt on an electric sewing machine, many of the much larger quilts I’d seen in Bath would have been made by hand; the first American patent for a two-thread machine wasn’t issued until 1846. In the same way I am in awe of Austen and Dickens writing without the help of even a typewriter, let alone a Mac, I am humbled to think of the hours these women spent in creating a textile legacy for their country’s future generations. The two month process of learning a craft associated with the part of the world where I was living made me appreciate aspects of the region’s history and early life, perhaps more than visits to American museums on this side of the Atlantic did. The quilt I made is still here, draped neatly over a chair in the spare bedroom, a reminder of eight weeks of cutting, pinning, sewing, and then unpicking when it all went wrong — but eventually finishing. Eight weeks of learning a new craft…and so much more. Readers, what about you? What would you like to learn in your adopted country, and what else would it teach you? STAY TUNED for Wednesday’s post! What a great question! I want to learn Turkish language the most and then I’d like to learn Turkish cooking Turks are over-the-top proud of their “Turkish kitchen” forged from their years as an empire. They brought all the best recipes home with them. By the way, I too had the same reaction to quilting class. It is a lot harder than it looks! Oh goodness, that’s not too far from me. 🙂 I must confess, I haven’t done any quilting since that 8-week course – I think I do prefer it as a spectator sport! Haha. I don’t blame you. Let’s just say my final product was less than professional. Happy spectating! Hope you’re enjoying your time in New England. That was my home for years! Like Karen, I too would like to learn Turkish. I made some strides this summer while living with my in-laws but I still have quite a ways to go. I’d also like to learn more about ebru, the art of paper marbling. It’s fairly easy to do but I want to learn more about the different styles. These comments are fabulous for building a bucket list! Paper marbling…that hadn’t crossed my mind before. Must investigate! I’m interested in pretty much any traditional art form of where I live or stay, but the real thing I wish I would learn is the language. I’ve spent the past five years in three different countries and my language skills are appalling. It’s completely my fault because I make excuses all the time (I’m an English teacher so I have to speak English all day, Chinese writing is too hard for me, my friends want to practice their English with me etc etc). Yes, isn’t that a problem when your first language is English? I remember going to Austria, years ago, and trotting out my German in a shop, asking for something or other. The reply came in English. Wouldn’t mind, but at the time my German was quite passable. I have a crazy quilt my (American) great grandma made in the 1920’s (a ‘crazy quilt’, for those who don’t know, is a quiclt made out of scraps of fabric, with no pattern at all). I often think I’d like to make a quilt out of my husband’s old worl shirts I’ve saved over the years, but then I sit down to teally think about it and I KNOW I’m going to struggle! Maybe one day… I admire your determination! And a class is a great idea. But back to the question. I would love to become fluent in French. Yes, I live in England, but I feel embarrassed that many English people around me know French and I don’t and I feel frustrated that when we visit France I am the one who can’t converse with the locals. But if I had to say something specifc about England… probably what I’d say is that I’d love to learn garden design. I enjoy my garden and I learn by trial and error but I have amental block to latin names, and I struggle with which plants prefer which conditions and what soil types are best for fruit trees and so on. Gardening is such a huge thing in Britain–particularly because the climate is so perfect for lush gardens, that I would love to learn to design and maintain our garden like a pro! Oh goodness, I’ve also got various pieces of clothing that I think would be nice to do the same with. It probably won’t happen, though!